Léargas: THE LAST OF THE SUMMER WHINE. THE LAST OF THE SUMMER WHINE. ‘The good weather puts everybody in good form’ your man remarked. We were sitting in the Hatchet Field. 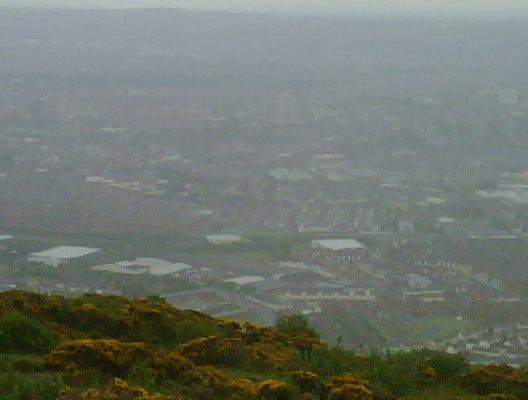 Belfast sprawled below us. Its narrow terraced - peace wall bisected ¬- streets, new apartment blocks, church spires, old mills stretched before us, until yellow cranes dominating, it dipped its feet into the Lough. In the distance the coast of Scotland shimmered in the clear warmth of a fine June day. Your man was master of all he surveyed. ‘Thon’s our house’ he said pointing down at the Murph. I ignored him. The mountain slope was loud with bird song. All around us a carpet of late bluebells almost on their last legs, gave way to verdant green young bracken and other ground cover which had replaced the scorched stubble of recent gorse fires. The mountain had healed itself from the hurt inflicted on it by morons. 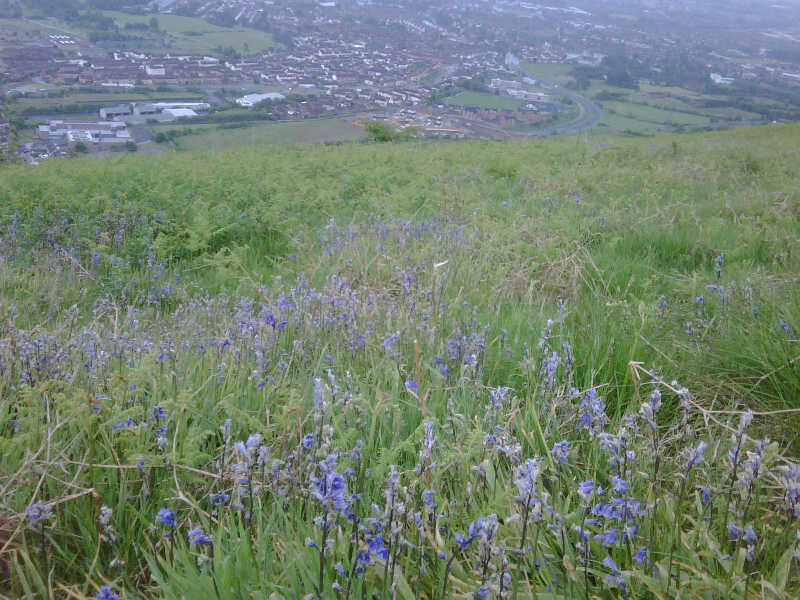 ‘When I was a wee lad we used to pick blue bells and bring them home to my Ma,’ your man continued. ‘So did I. She used to put them in a milk bottle on the scullery window’ I replied. ‘You mean the kitchen’ your man corrected me. ‘Why do you say scullery instead of kitchen?’ your man went on. ‘I don’t say scullery instead of kitchen’ I responded with great patience. ‘Well do I?’ I repeated. ‘Nawh you don’t’ he eventually conceded. ‘You don’t need to take the needle’ your man retorted. ’youse Falls uns always cry poverty. 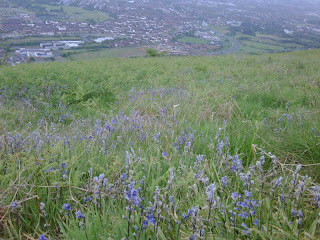 I was only reminiscing about the bluebells. You knew my ma kept the ones I got her in a vase in the kitchen but you just wanted to get in your wee bit about the milk bottle and the scullery. You’ll be telling me next about the cold water tap and the toilet in the yard’. ‘Well.. why shudnt I?’ I was hurt by his sharpness. ‘ Thems the way things were’. ‘They are for some people’. ‘No’ I conceded, sitting up from where I sprawled beside him. ‘Well you know you’re not going to get another fifty years’. He waved expansively at the vista which surrounded us. ‘Luk’ I turned to him ‘I’m the one that always appreciates it all. 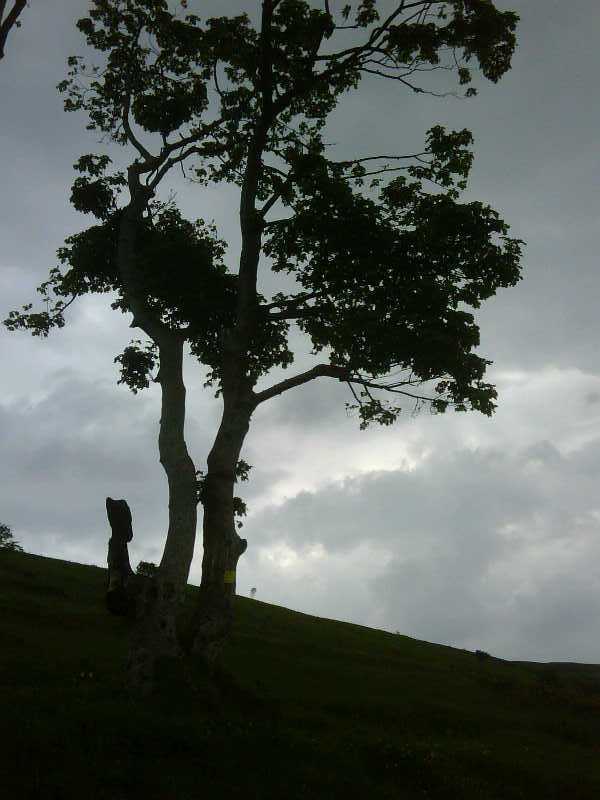 You’re usually the caster upper, the contrary one, the dark cloud. And now you’re starting to get on my wick. You get on your soap box just because I used the word scullery’. ‘I was not’ I protested. ‘Well chance wud be a fine thing’ he suggested with a sigh. ‘The point is to live in the moment. Listen to the birds. Breathe the air. Stop gurning. Live in the moment. And appreciate it. You were all set to launch into the five sorrowful mysteries. All set to ruin this lovely day’. I turned away in frustration. ‘That’s sexist’ your man shot back. ‘Lets go home’ I said. The good weather really does put everyone in good form. We tramped off together arguing furiously just as we did when we were only ten years old. The more things change …….. Meanwhile the birdsong continued unabated. The flora and the fauna ignored us. The mountains were silent witness to our bickering. 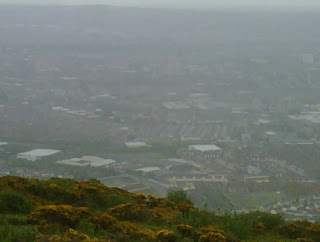 And Belfast basking below us, paid no heed. You bing to me the lovely area , you have , almost a special secret. My visit to the north of Ireland ,have been some of the best times in my life, in the last few visits ,more so than ever. I almost hate to see any news at times , the secret is out more people take notice , the good with the bad. The Secret is out , you have a special place Gerry , maybe the center of the world. I read that Ireland could have been Atlantis a legendary island first mentioned in Plato's dialogues Timaeus and Critias. A place of great minds and small scullery rooms, were children learned about life and dishwahing, than when on to create wonderful spring days.